It takes a special kind of nightmare to make a firefighter cry. When firefighters showed up at a dilapidated house in Long Island, New York, on Saturday, they knew something wasn't quite right. The fire had already been put out and the couple who lived there was frantically trying to cancel the call. They didn't want anyone walking through their front door. "It turned into an uncooperative caller," one of the first firefighters on the scene told The Dodo. "They had put the fire out themselves and they were refusing to leave the house. We came anyway." The firefighter, who didn't wish to be identified for this story, walked through the front door, where he spotted four or five dogs in a ruined kitchen. Then he went downstairs amid heavy smoke. "I started opening doors, and every door I opened, there were more dogs," he recalled. "Five more dogs here. Six more dogs there." A dog scampered past him and slid under a wide gap beneath another door. The firefighter opened that door and stopped in his tracks. "There were flies and maggots and feces two inches deep on the floor," he recounted. 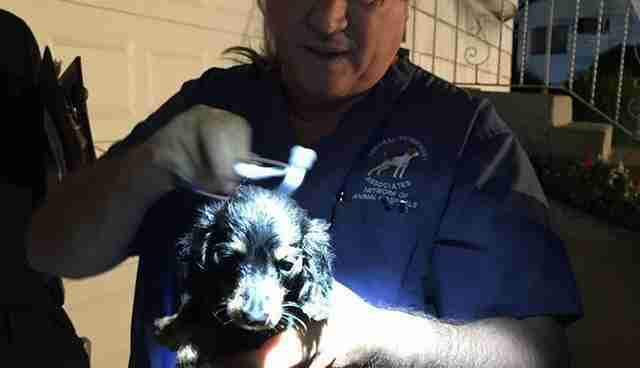 "A mother dog was nursing her puppies just completely soaked in feces and urine." All the food bowls were empty. A container had water in it, but the dogs were running through it, dragging feces everywhere. He walked outside and directly to the man who lived there. 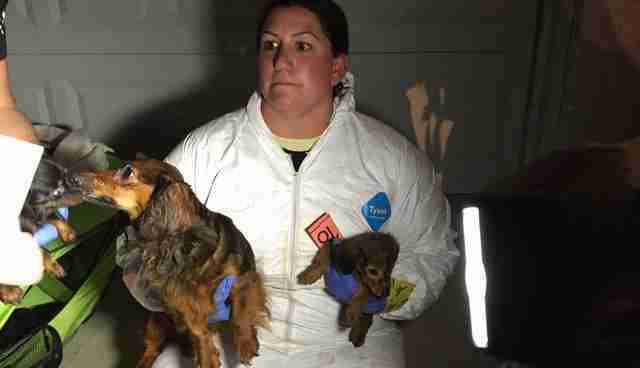 "You ought to be ashamed of yourself for treating these dogs like this," he said. "He said something like, 'I'm a breeder and this is my income.'" At that point, the firefighter admitted, "I may have lost my cool." "I've seen a lot of horrible things from people and it doesn't really bother me much, but when it comes to animals I absolutely cannot deal," he said. "All I cared about was the dogs and getting them out of the house." By that time, the dogs had escaped the house and were running throughout the neighborhood. "The neighbors had never seen a dog there," the firefighter recalled. "These dogs had never been outside before. They didn't know what it was like to walk on grass." 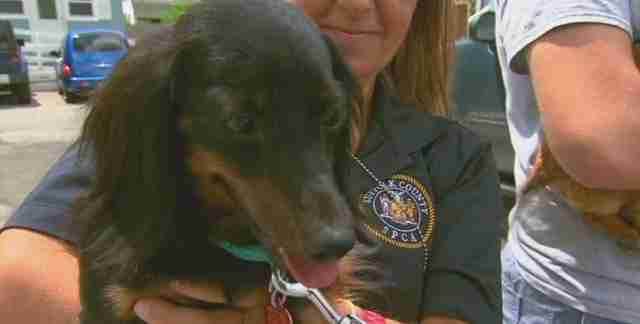 In all, 27 dachshunds were rescued from that house in the tiny hamlet of Hauppauge. "That smell was absolutely unbelievable," Roy Ross of the Suffolk County SPCA later told News 12 Long Island. "The people living in the house, how they were living there was unbelievable." 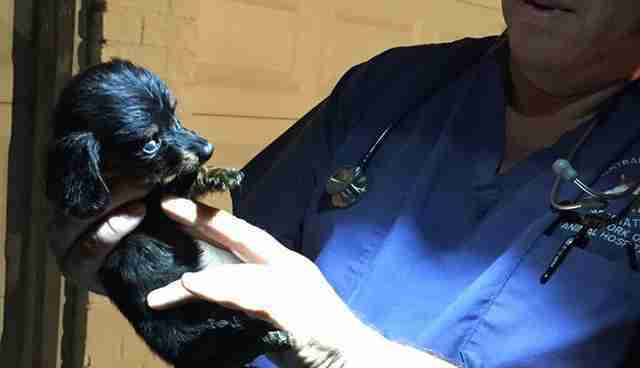 The dogs were taken to various local shelters for much-needed medical care. Their former owner, John Lowery, faces 27 counts of animal cruelty, charges that carry a maximum sentence of a year in jail. But for the dogs, freed by their dungeon at last, new lives await. They're currently being cared for by the Islip Town Animal Shelter and the Save-a-Pet Animal Shelter. But both shelters are already accepting applications to adopt them - and give them the real homes that have eluded them for so long. Think you can be their hero? Call Save-a-Pet at 631-473-6333 or the Islip Town Animal Shelter at 631-224-5660.